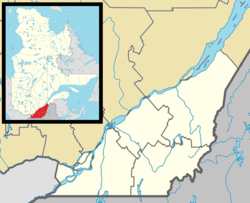 Pointe-des-Cascades is a village municipality in Vaudreuil-Soulanges Regional County Municipality in the Montérégie region of Quebec, Canada. It is located on a spit of land where the Saint Lawrence River flows into Lake Saint-Louis. The river has here a significant drop, forming several cascades which give the village its name. Starting in the mid-seventeenth century until 1700, many military expeditions arrived at this place in order to portage around the cascades on the Saint Lawrence River. The first reference to Pointe-des-Cascades appeared in a text of Louis-Armand de Lahontan in 1684 and on a map of Deshayes in 1695, when Pointe des Cascades was included in the Vaudreuil Lordship. In 1893, the post office opened under the English name Cascades Point (renamed in 1951 to Pointe-des-Cascades). A few years later construction began on the Soulanges Canal and when it was completed in 1899, the village became the eastern, downstream terminus of the canal. In 1958, it closed when it was superseded by the new Beauharnois Canal. The paths along the canal are now used as a regional cycling route. In 1961, the Village Municipality of Pointe-des-Cascades was formed on the territory of the Parish Municipalities of Saint-Joseph-de-Soulanges and Saint-Michel-de-Vaudreuil. Commission Scolaire des Trois-Lacs operates Francophone schools. Lester B. Pearson School Board operates Anglophone schools. It is zoned to Birchwood Elementary School in Saint-Lazare and St. Patrick Elementary School in Pincourt. ^ a b c d "Pointe-des-Cascades (Municipalité de village)" (in French). Commission de toponymie du Québec. Retrieved 2009-02-02. ^ "2011 Community Profiles". 2011 Canadian Census. Statistics Canada. July 5, 2013. Retrieved 2014-02-19. ^ "2006 Community Profiles". 2006 Canadian Census. Statistics Canada. March 30, 2011. Retrieved 2014-02-19. ^ "Les écoles et les centres". Commission Scolaire des Trois-Lacs. Retrieved 18 January 2013. ^ "School Board Map." Lester B. Pearson School Board. Retrieved on September 28, 2017. This page was last edited on 28 July 2018, at 03:10 (UTC).